In 2014, after the London Worldcon, Lisa and I spent several days in London using IHG offers and points. In order to make this work, we spent two nights at the then Intercontinental Westminster (it's changed flags since then) before moving to the Holiday Inn Express Southwark. One of the various things in our Intercontinental room were some of the slippers as we've had at many different hotels. Unlike most of them, these slippers actually fit my large feet, so I took them with me. I've been using them at home, because we have some hardwood floors and also because the carpet attracts the little "goatheads" (caltrop-shaped weed stickers that are nearly as painful as stepping on a piece of Lego). Of course these slippers are not intended for long-term use, but I seem to have squeezed more than 3 1/2 years out of the first pair before I decided that it was simply too worn out. A couple of days ago, I switched to the hitherto-unused pair. 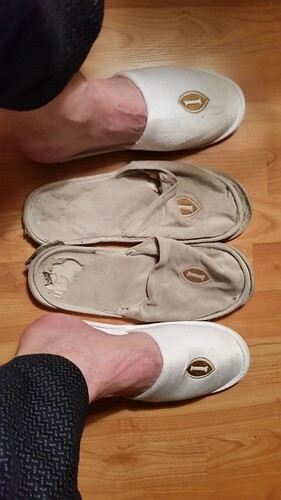 This picture shows you what more than three years of using slippers intended for only a few days' use does to them. I hope I'll get as much wear out of the second pair as I did from the first.